Annotated view of my stops on the way to Clemson. Click to enlarge and see detail. Summary – 11 stops, Average distance between stops: 34.3 miles, Average time between stops: 2 hr, 40 min, Average stop duration: 17min, 44sec. Notes: it rained a bit in North Georgia, but it was dry for all of Alabama and South Carolina and most of Georgia. There was still some pretty big temperature swings, hence all the clothing stops – especially Brasstown Bald and US-76 where it went from hot and dry to raining and cold twice in short succession. Annotated view of my stops on the way back home from Clemson. Click to enlarge and see detail. Summary – 19 stops, Average distance between stops: 19.9 miles, Average time between stops: 1 hr, 41 min, Average stop duration: 18min, 42sec. Notes: it rained quite a bit in Georgia and Alabama so I had to stop a bunch for clothing, covering Garmins, etc… Also, I had some major charging / battery problems pretty much the whole ride so any stop labeled “charging” is a stop I didn’t want to make, but was forced to make in order to plug devices into wall outlets. Also, the Vinings Starbucks stop and the Cedartown Waffle House stop were both longer than I wanted to stop but I had to wait for devices to charge. Annotated stops round trip including my 9.5 hour stop at the Holiday Inn Express in Clemson. Click to enlarge and see detail. In RAAM, of course, sleep stops also count against your time. 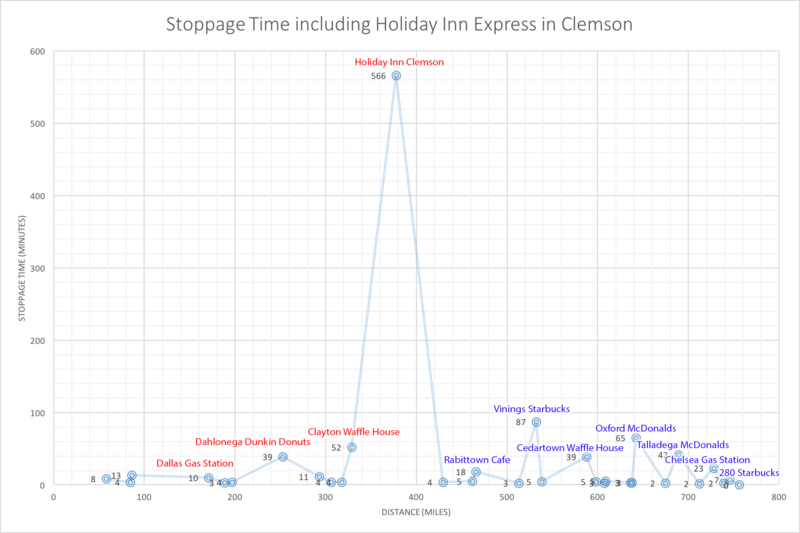 So including my sleep stop in Clemson, here is the overall stop data. Even my stop in Clemson was longer than I wanted it to be. I only slept for 7 hours, but I was stopped for 2.5 hours longer than that mainly so I could charge lights, di2, and garmins before leaving since I had only charged my powerbanks overnight. So it’s a little unfair to compare to RAAM, but in RAAM I only averaged 17.6 miles between stops so 24.4 miles is quite an improvement and would have been even better if I hadn’t had the extra stops on the second day trying to keep my devices charged. There was also another major improvement for this ride: cadence! This was quite the adventure with tons of climbing. I was really wanting to do a side-by-side comparison of Cheaha, Brasstown, and Sassafras on the same ride — but that will have to wait until next time! It was easy to see the impact of having a 32 tooth rear cassette on my overall shifting data – mainly, my average cadence went up quite a bit compared to RAAM. Also, I was consciously trying to spin an easier gear all the time to help avoid smashing the bottoms of my feet by mashing too big of a gear. One of the ways that I would do that is when I got to the bottom of a hill I would shift into easier and easier gears while still in the big chainring so that there would be a bigger jump when I switched down to the low chainring. I would still switch to the small chainring at what I perceived was my “normal” time so that meant I would be spinning a really high cadence into the bottom of the hill. Then I would move up into easier gears as necessary. 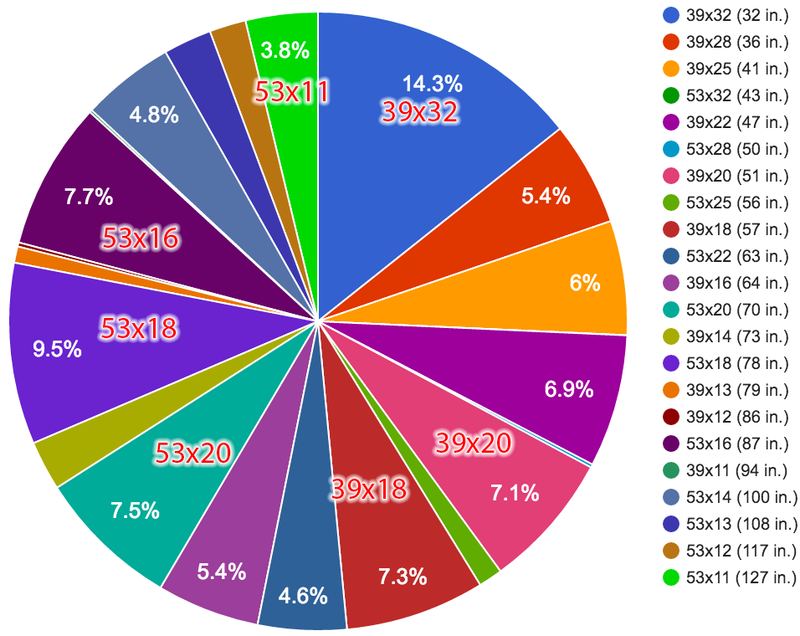 Because of this, there was a lot 53×18, 39×18 transitions on day 1 and 53×20, 39×20 transitions on day 2. This really helped as my feet were pretty much shot by 1/4 of the way through RAAM. This ride, which was also 1/4 of RAAM saw my feet get not nearly as sore as RAAM – and that is even with a 1.2 mile hike up/down on Brasstown in my speedplay shoes, which killed my feet at the time. But because of spinning the easier gears, my feet were able to recover some and felt better by the end of the ride. Shift data and shift map below! Shift map for my ride from Hoover to Clemson via Cheaha and Brasstown. Click to see an interactive version. Shift map for my ride back home from Clemson via Cheaha. Click for an interactive version. This entry was posted in Adventure, Racing and tagged analysis, data, raam on March 31, 2016 by kartoone. Duuuuuude. Love the data analysis. No idea how you do it day in and day out, but it’s inspirational. I can’t even fathom cutting ONE of those two rides in half and doing it over two days. I just got my first 300km (320, actually), and it becomes a crazy mind-game you get yourself into. Doing twice that distance, on back to back days (well, 30+ hour days) is just completely beyond me. Truly inspiring. It’s good to see your insight into your shifting data too. Hopefully in your 2016 RAAM attempt you’ll do better and won’t do it so painfully (and with a little luck, you won’t get those scorching hot days). Thanks Mick – it’s definitely something you work up to over time, but usually in a stepwise fashion – 300k this time, but then your next big ride will be 400k. Then you jump up to 500k after that. It helps to do a 500 mile race supported with a crew – then you feel like you can do anything under that distance by yourself unsupported. I’m hoping that learning to spin a higher cadence will help ease the nerves on the bottom of my feet. Also, I’m aiming for 2017 to race RAAM again, it takes too much time and money to try to come back and race it again this year. Thanks for responding. The 320 was solo, but I’m looking to do a supported 400km in June, so hopefully it’ll be easier and smoother to get through. It’ll also be winter here, so I won’t be subject to the same heat I was in the 320. The ride is with a local audax club for the Festum Prophetae (Eddy Merckx’s birthday). So like you say, it’s something to work up to. I’ll continue to build upon that base this year and hopefully can do something like you suggest and get into a big 500 mile race with crew support. Following your rides has certainly been humbling, and the data analysis that you do is fantastic. As an engineer who likes to get his geek on, it really piques my interest. Knowing that analysis such as yours can lead to massive improvements–one being the feet pain to gear ratio correlation–is pretty cool. Those insights aren’t something that most people would have the knowledge or inclination to gain. I’d thought I’d read somewhere that you were doing the 2016 RAAM, but that might have been someone being presumptuous on Strava. I’ll be following your efforts in 2017 and look forward to following your epic adventures here and on Strava throughout 2016.